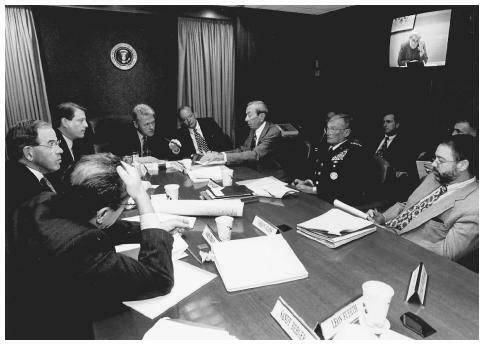 President Bill Clinton, at the head of the table, meets with national security advisors at the White House in November 1995, to discuss the peace agreement in Bosnia. Digital National Security Archive. "Presidential Directives on National Security from Truman to Clinton." 2003. < http://nsarchive.chadwyck.com/pdessayx.htm >(April 25, 2003). White House. "History of the National Security Council, 1947–1997." < http://www.whitehouse.gov/nsc/history.html >(April 25, 2003).